The couple were reportedly in a nasty fight last week that left the actress with severe injuries and she’s still receiving treatment at an undisclosed hospital in Lagos. 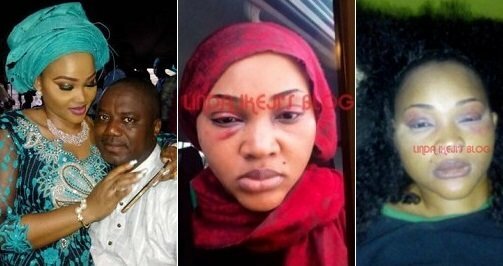 Nollywood actress Mercy Aigbe-Gentry’s has been reportedly beaten up by her husband Lanre Gentry. The actress has been enduring domestic violence for a long time in her marriage but it has gotten worse lately. We went through the actress’ Instagram page where she put up a photo of a battered woman writing, ” Say no to domestic violence. Only a Coward hits a woman! REAL MEN don’t HIT! “. This is not the first time domestic violence allegations have trailed Mercy Aigbe’s marriage. In 2013, continue on the next page.. This entry was posted in Celebrities, Nigeria, Video on April 29, 2017 by admin.